http://www.blogger.com/html?blogID=1755139666841541603 about a dream: But what does it all mean? Poor Maggie really struggles sometimes. No, not with juice boxes or sharing her monster high dolls (though she does struggle with those things. She's only 5! ), it's those existential crises. This is what my drives are like. Constantly! Lately though, Maggie has struggled with the point of life. Why are we here? What are we supposed to be doing? What is life? She asks with italic-like emphasis too. It's cute in one sense, just because it's so uncommon to hear from a 5-year-old, but she's really upset about it. And I'm not sure what to do! I tell her that I think the point of life is loving each other, and she kind of likes that, but I can tell it's also woefully inadequate. So I tell her that some people, many people, spend their whole lives trying to answer that question, but I think she finds that answer even more depressing. Today she was tired so she was even more upset by the idea than usual, but she wailed "How can I go to school and learn when I don't even know what life is?" I guess my bend is more science than philosophy, because I never struggled with the "why" of it all. Why are we here? Because evidently, there exists within the laws of the universe certain outcomes that, however unlikely, are statistically possible, and we're just one manifestation. Probability. Boy are we ready for a nice summer vacation!! 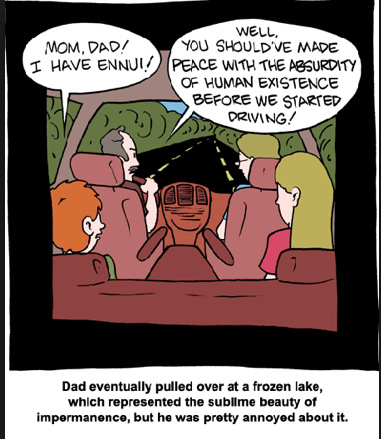 I can just hear Maggie saying "Mom, I have ennui!"